When you have an accident on your motorbike you’re going to end up on the tarmac. The right clothing can save you. If you’re travelling at any kind of normal road speed when you come off your motorcycle, you’re likely to skid along the road surface and suffer from road rash. Road surfaces will shred through jeans and normal clothes on impact so it’s vital that your riding clothes can withstand abrasions and skids as well as impact. There is a reason so many bikers wear leather, and it’s not just for the typical biker look. Leather is robust and copes well in motorbike accidents because it is so durable. It’s also supple and comfortable to wear which is why it’s so popular. There is also a wide range of motorbike-specific, synthetic materials that work just as well as leather and they normally throw waterproof and breathable properties into the mix. Materials like Kevlar and ballistic-nylon are incredibly tough and strong, and they can be adapted to improve breathability or keep the warm in and water out. 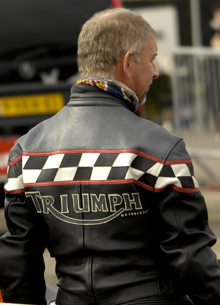 Either material is good however you must make sure that both the jacket or trousers are built for purpose – they must be designed and tested for motorbike riders. As is the case with any item of motorbike attire, purpose and properties are two important aspects you must consider when you’re looking to buy. If you’re a rider who likes to be on your motorbike all year round, in rain, wind and sun, you need clothing that’s adaptable to weather conditions as well as safe. For this you’ll need a jacket and trousers that are waterproof and breathable. If you’re a fair-weather rider and only go out when the sun’s out, then something breathable is advisable but if you’re someone who likes long rides on the motorway, then a jacket and trousers that copes well with windblast are the way to go. When buying motorbike clothing, you need to be aware of what kind of riding you’re likely to be doing and buy the most suitable clothing to fit that purpose. Clothing made specifically for motorbike use will usually have armour and protection built into them. This armour is made of impact absorbing materials that will protect your body on impact in a crash. Ideally you want that armour across your back, elbows, knees, hips, shoulders and chest. All these pieces of armour should come with a CE safety rating that means they have been tested. There are two CE standards, CE1 and CE2, the CE1 standard is higher. Retro-fit armour can be fitted into most leathers, jackets and trousers however they should be safely fitted and not move about when you are wearing them. Leathers, synthetics and any bike clothing should fit properly. If you think about the physics of skidding across tarmac, baggy clothes will get caught in the road surface and could be ripped off, leaving you unprotected and severely injured. On the flip side, if leathers, jackets or trousers fit too snugly then you lose a lot of your movement and that can badly affect your ability to ride normally. Again, purpose fits in here. Sports bikes force riders into more severe riding positions, so leathers and clothing for a sports bike rider must allow for flexibility. You can buy all in one race suits – the ones the MotoGP riders wear on track – and these offer the most protection in an accident. Unfortunately they are very expensive. An alternative is to buy trousers and jackets that can zip together. You can now buy jackets with airbags built into them. The airbags activate on impact, providing a cushion during accidents. As you’d expect of this kind of technology, they’re extremely expensive. It’s important that your are seen when you’re on the road, particularly when riding at night, in autumn and winter. Wear reflective clothing and bright colours when on the road.